Aren’t there times when you try everything in your capacity to recharge your weary mind and yet feel all the same? Times when every magic formula ever invented by the mankind – from food and drinks to movies and music – fails to keep your spirits up? When all else fails, try Vitamin Sea! And there is no better place to take in a good dose of this magic medicine than the beaches of Goa, where roaring waves, golden sand, and brightly shining sun come together to give you the best revitalizing experience ever. However, your dream-like holiday can turn a little hellish unless you know how to dare the crowds (read several thousands of people) that throng these sandy havens, every day, all day. Or you should look for some less-crowded options in the region. The question, however, is this – are there any beaches in Goa that are uncongested and free from the swarms of sun lovers and party freaks? Beaches where you don’t have to navigate your way to the waves through loud and buzzing packs? YES, YES, YES! Stay with us till the end of this blog to discover some of the best beaches in Goa that welcome you with their quiet, serene surroundings, while the gentle waves and sandy breeze soothe you completely. North Goa is everything you ever imagine a happening hub to be – late night parties, shopping markets swarming with people, awesome food, great beaches, and naturally, lots and lots of tourists all through the year. It might sound like a paradox even to suggest that the place has less crowded beaches, but it has. These balmy beaches are similar to or even better than the ones thronged by tourists the entire year. Here is a list of some of the secluded beaches in North Goa for people who are looking to escape the crowd. 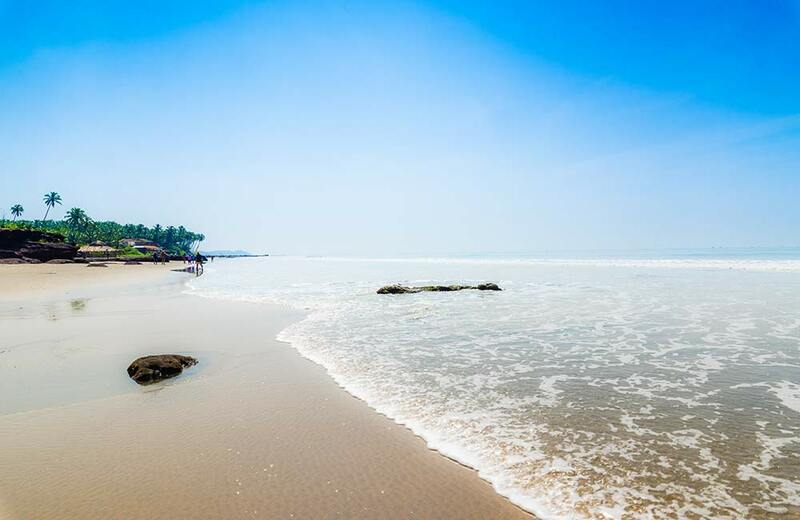 This beautiful beach located in Arambol, a traditional village inhabited majorly by local fishermen, spreads over a stretch of about 16 km and is covered by cliffs on both sides. Sometimes also referred to as Harmal, it is a cove-like beach that also contains a freshwater lake and several busy markets in its periphery. At a short distance from here, between Kalacha Beach and Mandrem Beach, lies a hot water spring. A mud bath in its sulfurous mud (which is believed to have amazing healing properties) can be a great option if you wish to do something special and unusual during your beach holiday. Arambol Beach is famously called the hippie capital of Goa as mostly hippies frequent this beach for the mud bath, fun-filled night parties, and some soulful music. What’s more, the place has a unique Bohemian and laid-back feel to it and is surrounded by a number of shacks where you can indulge in a bottle of beer and tasty finger food. 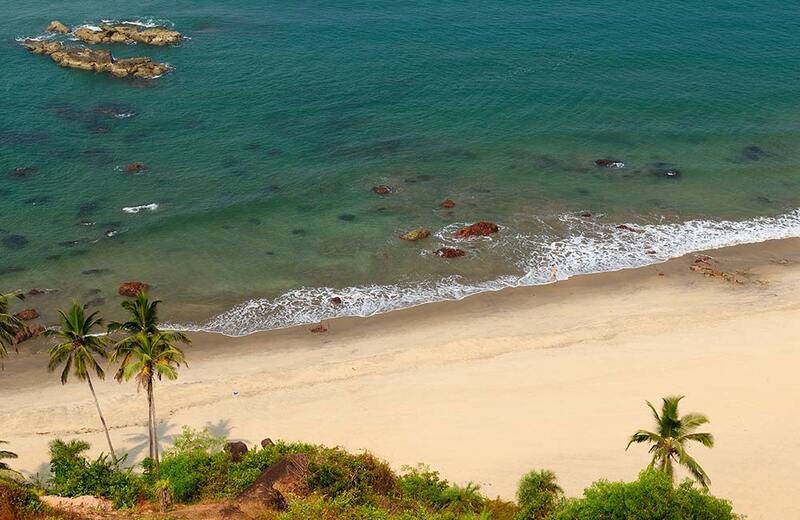 With a thick jungle and a famous banyan tree located in its surroundings, it is one of the greenest beaches in Goa. Sounds like a perfect getaway for relaxation? Wish to take a look at the adorable dolphins gliding in and out of water or spot the white-bellied fish eagles that land on casuarina trees or the Olive Ridley turtles in their natural habitat? Head to Mandrem Beach, one of the quiet beaches in North Goa where you can enjoy all these and more. With white sands covered by beach shacks offering a cozy place to spend some alone time or strike a romantic conversation with your partner, this beach offers you all the privacy you yearn for. Also, the numerous bamboo bridges atop the creeks formed during high tides let you spend a relaxed evening, sitting with your feet dipped in the cool water. 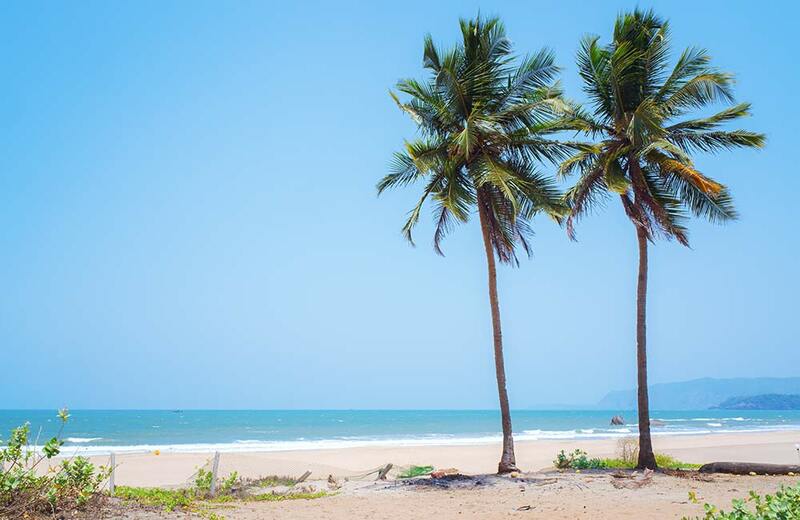 Like all other less-crowded beaches in Goa, Mandrem also is not fully developed in terms of tourist infrastructure, so you won’t find luxury resorts or accommodation options in the surrounding areas. But if you have on mind a calm vacation with swaying palm trees and a refreshing breeze to keep you company, this is the place to be. 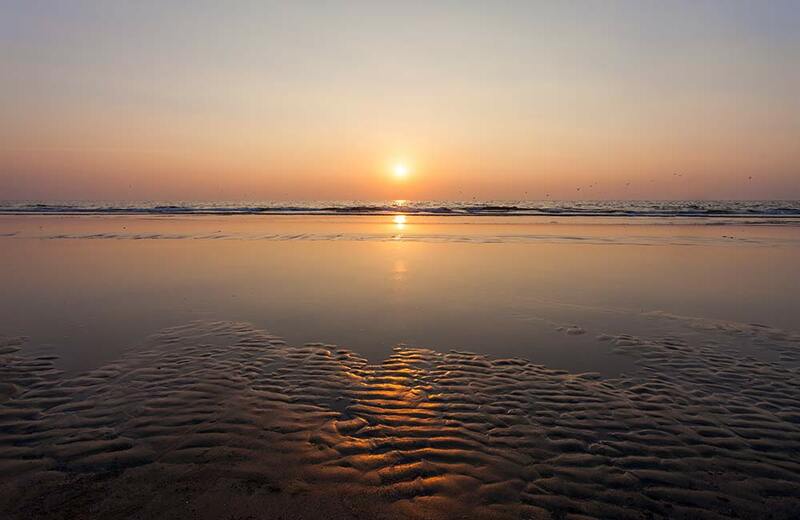 While Morjim Beach surely ranks top among most serene beaches of North Goa, it also serves as the nesting place where the Olive Ridley Turtles lay their eggs. For this reason, loud music and late night parties are a strict no-no on this beach. Instead, a fine range of non-noisy activities including therapies, watersports, and kite surfing is promoted here. Situated north of Chapora River, the beach is dotted with food and beverage shacks that serve delicious dishes. Don’t be surprised if you bump into Russians as this place is home to several Russian immigrants, a reason why it is often called Little Russia. Great surroundings, peace-loving crowds, and unmatched tranquility make it one of the best places to relax and revitalize at your own pace. Don’t forget to taste a glass of Feni while you are relaxing on the soft white sands of this beach. Nature lovers can even opt for a relaxing cruise in the Chapora River while sightseeing enthusiasts can visit the nearby Chapora Fort, located within 10 km. It is called Dil Chahta Hai fort these days and you know why! This beach lies between Fort Aguada and Candolim Beach, so the best way to relax here is to grab your favorite and set off to explore the surroundings. This is the perfect and nearest getaway from the city which offers you a picturesque view of the ramparts of the fort and the deep-blue sea, with the crashing waves singing in your ears. That’s not all! The local markets in the area allow you to shop to your heart’s content. Now, coming to activities, your options are nearly endless here. Dolphin tours, paragliding, crocodile spotting and underwater photography are among the hot attractions of the beach. Those who want to enjoy some simple pleasures can swim in the shallow areas of the sea while adventure seekers can opt for watersports. The beach has a natural inward-curve, which makes it a safe place for people who wish to tread further into the waters. 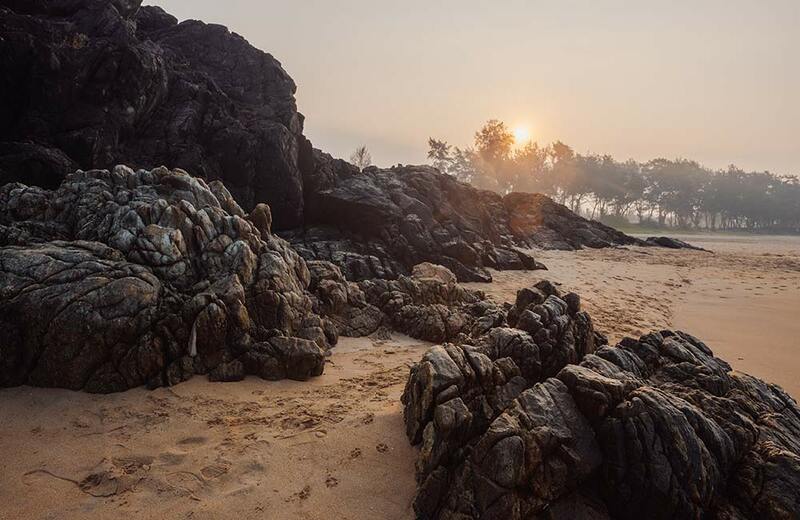 An isolated beach with rocks on the shore, Ashwem Beach can be best explored riding a bike along the shore as it is a long stretch that starts from the banks of the Chapora River. 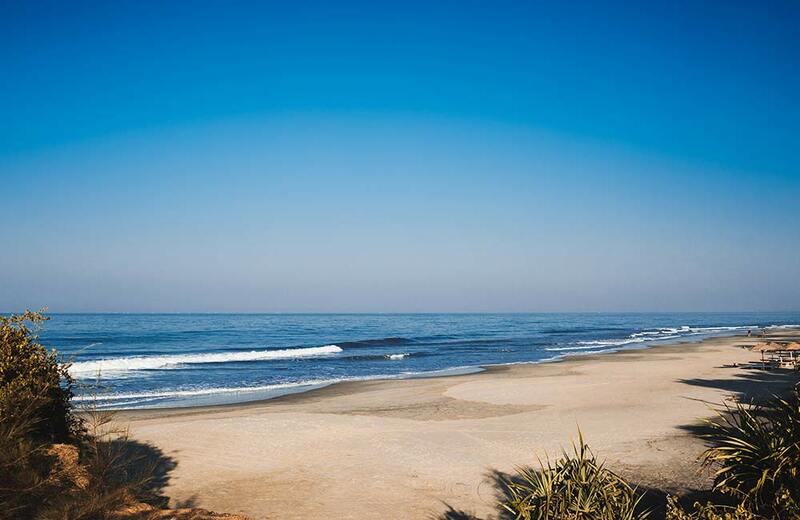 The resorts on Ashwem beach give you refuge from the heat while letting you have a luxurious stay and enjoy the sea and the sand to the fullest. Ranking top among the most well-maintained and cleanest beaches in Goa, Ashwem is also the nesting ground for the Olive Ridley Turtles. The gentle waves will allow you to swim until you are tired while the palm trees that line the beach make the place look stunning. Looking for a fun-filled holiday? Enjoy a drink and delicious local dishes at the shacks, pubs, restaurants, and cafes in the area, get a tan lying on a sunbed or engage in a watersport of your choice. You can even get a tattoo from one of the tattoo parlors located near the beach. If your kind of relaxation is watching the sunset sitting atop a rock, while the horizon is drenched in different hues of crimson orange, Ashwem will surely fulfill that wish as well! 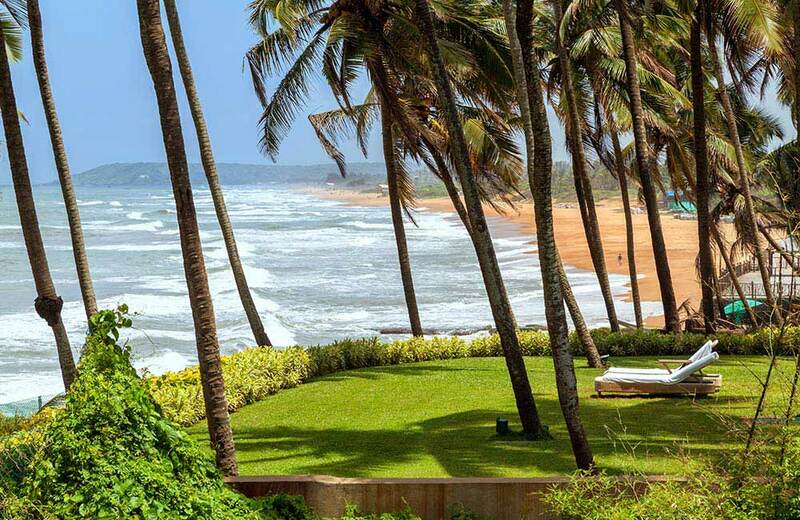 South Goa is everything that North Goa isn’t – serene and calm with quiet beaches, vast expanses of greenery, and less crowded areas. Naturally, the chances of finding quiet and isolated beaches are high as you go towards the southern regions. 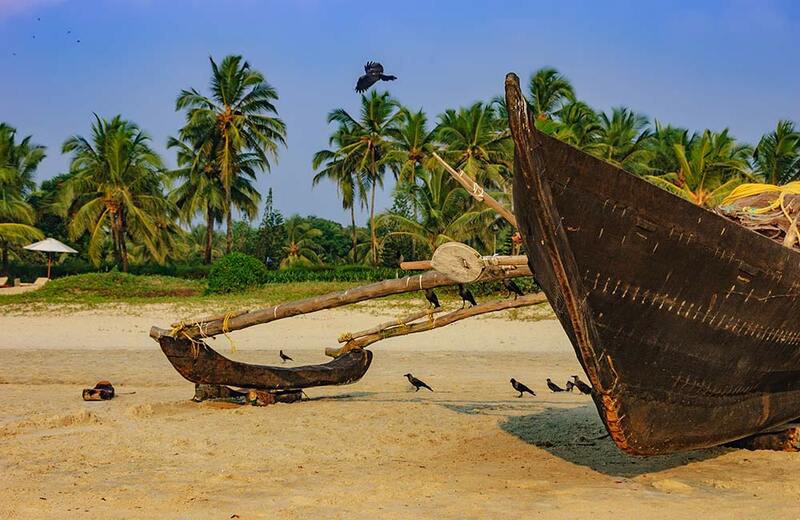 Here is a handpicked list of some of the less-crowded beached in South Goa where you can enjoy and a lazy, laid-back holiday. Surrounded by the Sal River and the Arabian Sea, this balmy beach is beauty at its best and will give you tranquility you cannot experience elsewhere. Anyone in the hunt of solitude can head straight to this beach where the blue brine, black lava rock, green coconut groves, and long stretches of white sand paint a spectacular picture of nature. Laze around the shore or take refuge from the heat in the cool coconut groves or indulge in some water activities – the choice is yours! 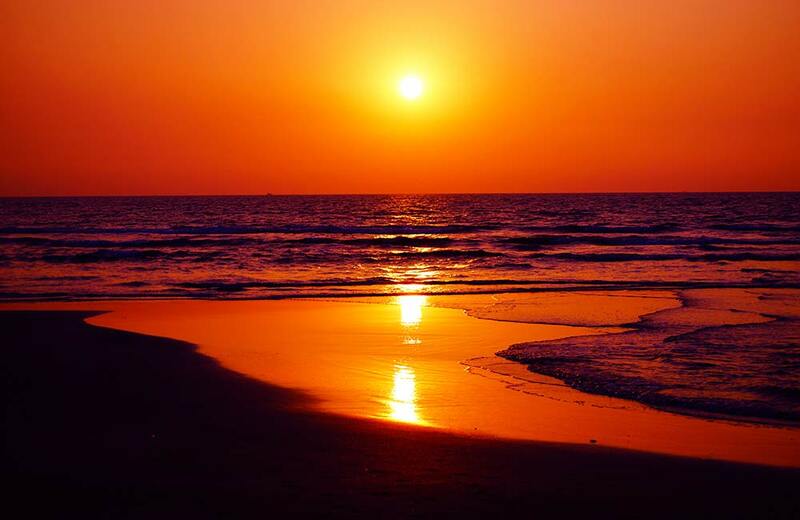 Cavelossim Beach is your best bet in South Goa for watching beautiful, soul-stirring sunsets. The place is pretty quiet and calm, even during the peak seasons, and the restaurants and shacks in the surrounding areas will cater to your taste buds. What’s more, you can even go for a cruise on the Sal River which meanders through the other side of the beach. Whether you are planning a family vacation, honeymoon or a quiet vacation all alone, this is indeed the place to be. If there ever is a beach devoid of hawkers stalking people to fulfill their daily sale, it is none other than the Agonda Beach. It stretches for three kilometers with only the sand, sun, and sea to give you company. One of the best places to spend some quality time with your partner, Agonda may top your list for a romantic holiday or honeymoon. Also, the beach huts will give you exactly what you are looking for – complete privacy. 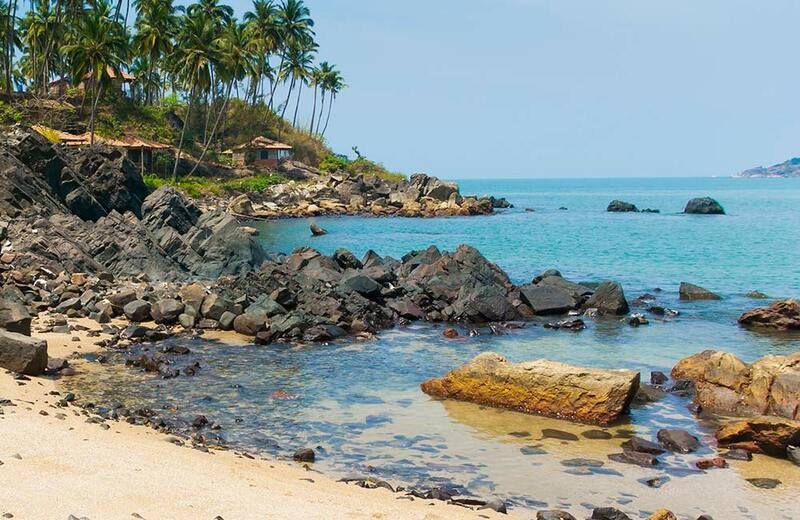 Located in the southernmost region of Goa, Patnem Beach joins the list on account of the tranquility it offers. While you are here, your happy moments are disturbed only by the whispering breeze, lashing waves and chirping birds in the vicinity. Palolem Beach, Goa is located within a walking distance from Patnem; and the beautiful Colomb Beach is located in between these two. Remember, the place is all about relaxing! You can opt for a quiet read in the beach shacks or take a stroll on the shores listening to your favorite music. You can also go swimming in the blue waters or laze around on a hammock or sunbed. Some of the best Goan food is available at the beachside shops for you to have a gastronomic experience. Should you wish to do something other than relaxing and indulging in good food and drinks, how about joining the yoga retreats which the beach is famous for? This astounding beach village with sparse fishermen population is a must-visit when you are in the southern part of Goa. Best known for its tranquil waters and nightlife, the beach stretches over 1.5 km with white sand, palm trees, and bamboo huts adding to its postcard-worthy surroundings. Its unusual crescent shape gives you a complete view of both the ends of the beach, which is a rare scenario. Another major attraction is the silent parties or ‘silent discos’ hosted here, in which you enjoy the music on headphones and dance to the tunes. Sounds interesting, eh? Palolem beach also served as the shooting spot for the famous Hollywood movie The Bourne Supremacy. This beach offers you a placid setting during the day and allows you to be a part of an active nightlife as the sun goes down. A major attraction here is the bullfight that takes place from October to March, every year. The long strips of sand are peppered with seaside shacks, restaurants, and beach loungers. You can relish local cuisines at these shacks, take a stroll on the shoreline till you are tired or check out the Church of St. John the Baptist Benaulim for its architectural beauty. Eating, relaxing, and sightseeing – well, that’s the best combo you can ever dream of, right? Compared to the crowded beaches in Goa, the ones listed above can be visited even during peak seasons. These beaches are located close to some of the best hotels in Goa, so book a room, explore these sandy havens till your legs ache, and be in tune with nature. Trust us, this is the best way to escape the buzzing city and to re-energize yourself, before returning to the redundant routine in your office cubicle. So, make the most of it!